Snag Yes , I'm old and crochety . Get off my lawn ! it's very easy to process tomatoes. i'm not sure what the issue is with "get all the trapped air out" because you have to leave some head space at the top and that is air. processing heats and expands that air out of the jar and the lid seals and the vaccuum is created. there is still some air in there, but not too much. There was air trapped down between the (quartered) tomatoes , one of the jars isn't near full . And the instructions said to stir things around in there to let it out - I didn't . They really are easy , but this is the first time I've done it instead of the wife . She knows all the tricks I'm learning ... but she has to work and wasn't here to help . And those 'maters needed cannin' right away . oh, ok, now i get it, when we put up tomato chunks there is usually enough liquid that such air pockets aren't in there that much. 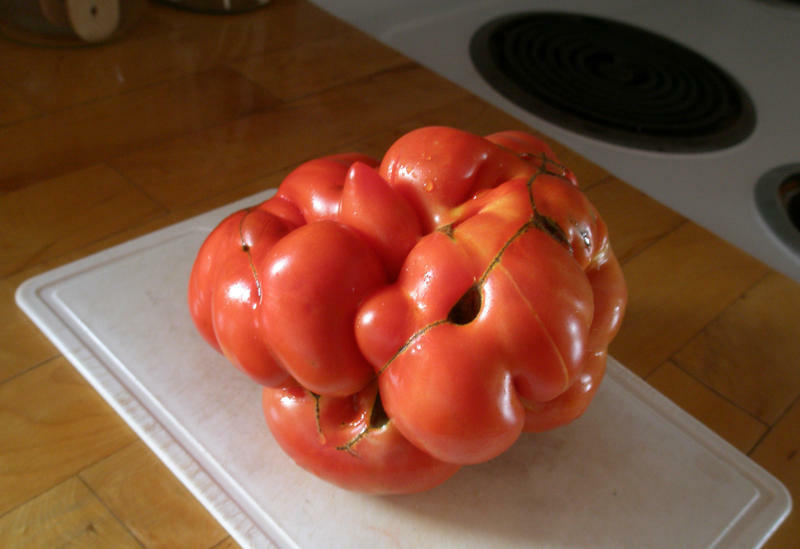 so perhaps you are using a less juicy tomato than we are (beefsteaks). the only times we've had issues with spoiling was one season when we had tomatoes with a lot of intrusions from the outer skin inwards and if we missed one of those and it was already starting to rot then it could ruin that jar. we only had one or two jars go off from that (out of several thousand). Mom's eyes being the way they are she sometimes can't see so i do actually try to do quality control and while i'm stirring the pots of tomatoes as they heat up i often can find things we've missed that i can pick out. there's enough acid in them that i could probably leave them in there but i'm picky. i doubt anyone other than me would notice (a very micro tiny speck and i'll track it down and get it out of there). Dayummmm ! Were they all like that ? i was so very glad to see that last year's crop were the more normal shape we were used to seeing. i'm not sure if that shape was from pollination or that those plants that year came from strange seeds or what.